Description: Power from DOBO heads up Track 9 out behind Tower-H to pick up his eastbound train at Yard-8. Description: 630am, a winter storm has just blown itself out as the power from EDSA comes around the wye to put-up. 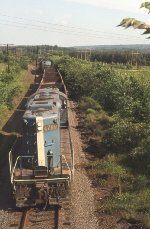 Description: B&M GP9 1741 lays over at E Deerfield, MA on Labor Day, 1981. 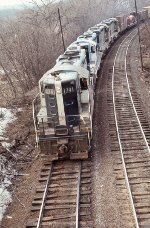 Description: CPSP southbound through Deerfield interlocking. Description: CPSP bringing his train southward over the bridge spanning the Deerfield River near East Deerfield. Description: Three years into the Guilford takeover, and our old B&M power is on the way out. Description: With BM 1724, ST 15 and BM 1741.